Saorsa gets a woof of approval from Baxter and Dog Friendly Perthshire! At the beginning of May the owners of Saorsa invited Baxter, Katie and Laurie from Dog Friendly Perthshire to come and stay at their stunning 4 star house. They had a great time at the house and exploring the local area and wrote this wonderful blog about their experience. With their permission, we are sharing their blog below and have included a link to their new website where you can find out more about all the dog friendly businesses in Perthshire and also see the full version of the blog with all their great photos. “It’s been a week since our stay at Saorsa in Kenmore and I think it’s fair to say we are all missing it! Located a short walk from the banks of Loch Tay and Kenmore, it’s ideal for a dog friendly holiday. Surrounded by beautiful walks and not far from dog friendly restaurants, cafes and pubs you are spoiled for choice of the places you can visit with your dog. Saorsa is a stunning new build close to the picturesque village of Kenmore. It’s beautifully decorated throughout with an open plan living and dining area. It also comfortably sleeps 6 with 3 double bedrooms (one bedroom can be turned into two singles) with the master bedroom having an ensuite. Saorsa has an upside down design with the living areas upstairs. It has the most amazing balcony with stunning views over to Loch Tay and the surrounding hills. 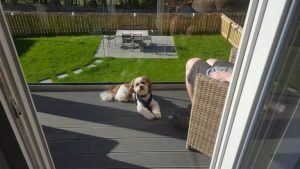 The balcony was definitely Baxter’s favourite spot and he loved making the most of the beautiful weather by doing some sunbathing. Saorsa is also very dog friendly in terms of accommodation. It has a secure garden at the rear of the house which is always a bonus as a dog owner. Inside the house there are extra features such as doggy bowls, a coat peg to hang your dogs lead and a welcome box at the entrance which has a list of dog friendly eateries nearby and things such as towels, poo bags, biscuits and a spare lead in case you have forgotten to pack any essentials for your dog. Baxter had a great time in the garden too! It was such a benefit to us knowing it was secure and he could run around with his ball and we needn’t worry he could wander off. We all had a great time enjoying the fabulous weather we were blessed with. Saorsa has a fabulous modern kitchen so if you are wanting to do some cooking while you stay it has everything you could possibly need but we decided to head over to The Courtyard Bar & Brasserie in Kenmore which is about a 10 minute walk away. The Courtyard Bar loves welcoming dogs and has a great doggy station where you can help yourself to a blanket, a bowl of water and biscuits for your dog. Baxter was extremely happy with this so while he was chilling on his blanket we were able to tuck into a couple of delicious burgers. The portions are great and I struggled to finish mine but I still found room to manage dessert, I highly recommend trying the creme brulee! We also discovered the nearby Highland Safaris which has a great dog friendly cafe and gift shop. The staff are so friendly and welcoming and Baxter was pleased he got to say hello to the resident black labrador Tia. They also have lots of fab walks nearby to explore with your dog and you can also try panning for gold! Baxter says he is going to try panning for gold next time he visits so he can buy a lifetime’s supply of gravy bones. We also had a quick visit into Aberfeldy where we visited The Fountain Bar & Restaurant, Aberfeldy Pet Shop (where Baxter picked up his favourite sausage treat) and had a walk around the Birks Of Aberfeldy which is a superb walk. We were disappointed not to be able to visit Habitat Cafe on this trip as it has an excellent reputation for welcoming dogs (check out their instagram Dogs Of Habitat Cafe) so it’s on the top of our list of places we must visit next! Saorsa Holiday cottage is the most perfect place for a dog friendly holiday. It ticks all the boxes you could want for going away with your dog whether it’s for a long weekend or a week or two. We were made so welcome and felt completely relaxed at Saorsa which after a very hectic few months is exactly what we needed. Seeing your dog just as relaxed and at home as you shows that Saorsa have nailed it in terms of being dog friendly. We would happily stay time and time again and so would Baxter. He gives it a big paws up and a waggy tail so it definitely gets our approval too. He is still day dreaming of his favourite spot on the balcony, it’s going to be difficult to top that!